OLD PARKED CARS. 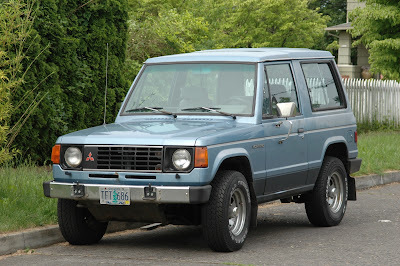 : 1983 Mitsubishi Montero. SUV would be wrong classification for this car, it's really a off-road car and quite uncomfortable to drive on road. The long model would be more like SUV. This is known as Pajero here in Europe and it was quite popular at the time. thanks for the input, anon. some of our tags are more perfect than others. 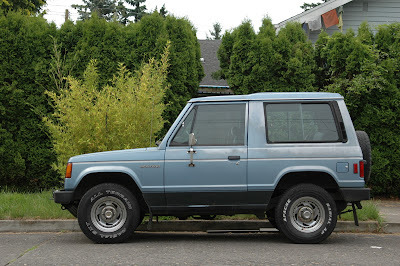 And Dodge used to brand it as the Raider, I recently un-forgot. These are awesome little rigs. If I wasn't in my Troopers I would be in some old school Monteros. always liked these, they are boxy but look good at being boxy. love this one especially because its a two door. 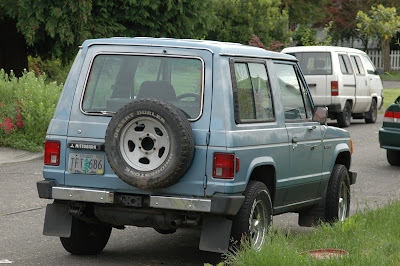 for some reason swb 2door suv's look more interesting to me, maybe because they are more rare where I live. I think back before they coin'd the phrase SUV they were called MPV's. Love those 80's as hell aftermarket wheels, fits it perfectly. Nice find. I was never on board with the Mitsubishis, but if I had to choose one it would be this (or the Mighty Max). It's probably huge inside. Looks like a a 1985 with the more basic grill.